More than 8 million people have been devastated by the Earthquake in Nepal on April 26, 2015. More than 1.4 million people need food and medical assistance with shelter. 4400 people are reported dead and 8000 injured. Darkness has unfurled the disaster-affected region. They are helpless, scared and trying to survive. They need electricity source. They need phones to connect their families and relatives elsewhere. 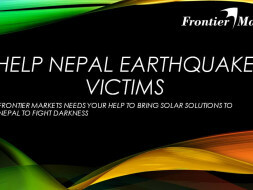 After over a week of discussions with various on-the-ground entities, Milaap is fundraising for Frontier Markets - a solar lighting distribution company with on-ground partners, to deliver solar lights with mobile chargers in response to the heavy power cuts due to the floods. 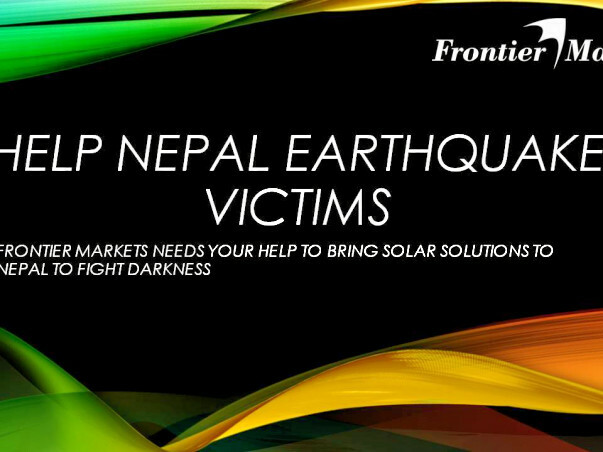 In response to this need, we are asking you to join hands and sponsor lights for us to airlift to Nepal and send to these victims. True to Milaap's approach towards rightful end-utilization and transparency, Frontier Markets will provide you with details about the Nepal Household that is receiving a solar lantern because of you. Not just that, you'll also receive an invoice once you make a donation, as well as a declaration form that this light will be sent through our ground partner, Sewa Bharati, an NGO in Nepal that is working on the ground today. The JS 30 MOB Sunlite Solar LED Lantern that is un-matched in quality, performance & design & a pioneer in portable off-grid lighting. The lanterns have the ability to consistently deliver high quality, durable off-grid solar lighting solutions that have an inherent smart functionality built into them and are extremely intuitive to use. The products are designed with the sole purpose of ensuring their clean light can be accessed by anyone, anywhere, anytime and during any circumstance – i.e. lamps that can be charged and used "on-the-go"! All costs associated with your contribution (including payment gateway fees and wire transfer) will be absorbed by Milaap – this is the least we can do. We encourage our community to stand in solidarity with distressed earthquake-affected people in Nepal and be part of the national effort to support them in this hour of crisis. Do contribute generously towards this relief.